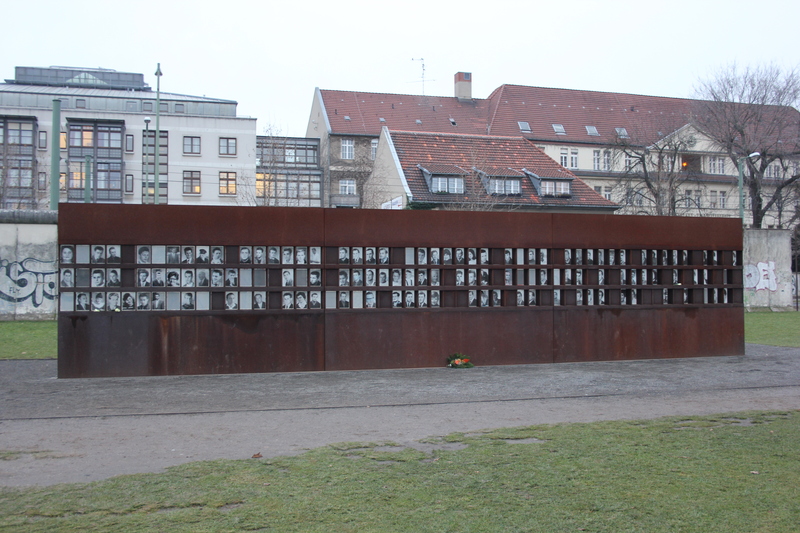 Just beyond the replica of the Berlin Wall on Bernauer Strasse is a memorial to its victims. The Berlin Wall was put up on 13 August 1961 and fell on 9 November 1989. During that time at least 136 people are known to have died there. Of those 136, 98 died fleeing from East to West; 8 were East Berliners who were not trying to flee; 22 were from West Berlin; 8 were border guards. Teenagers or children accounted for 42 of the victims. The 136 deaths numbers do not include those killed at the Berlin border before the wall was erected. Nor do they include the several hundred who were killed at the border area outside of Berlin itself. The memorial is simple, containing photographs of those killed, their names and dates. There are no biographies or details, although these can be found on the internet. The first photograph at the memorial is of Ida Siekmann, the first ever victim of the Berlin Wall. She died jumping from her third floor window in Bernauer Strasse on 22 August 1961, just 9 days after the border had been sealed. The next day would have been her 60th birthday. Just underneath her is Günter Litfin, the first person to be shot dead at the wall. He was killed two days after Ida Siekmann died, shot in the back of the head as he tried to swim from East to West Berlin. At the opposite end of the memorial is Winifred Freudenberg, the final victim of the Berlin Wall. He died on 8 March 1989, having flown a balloon out of East Berlin and into West Berlin. However, the flight was beset with problems and he was killed when his balloon crash landed after several hours. In between the first and last victims are many other faces, all subject to tragic and in many cases horrific stories. These include Peter Fechter, one of the Berlin Wall’s most well-known victims. He was killed four days after its first anniversary in August 1962, shot just as he reached the wall on the West Berlin side of the death strip. Injured and calling for help for 50 minutes, he eventually fell silent and was then recovered by the East German border guards. The West Germans dared not enter the death strip (which was East Berlin territory) but journalists took photographs of Peter Fechter as he lay calling for help. These were published all over the world to international condemnation. Then there are those who drowned in the River Spree. Many were trying to swim to freedom, but not all. There are several instances of children from West Berlin falling into the river. Whilst the river bank was in West Berlin, the entirety of the river itself was East Berlin territory. East German border guards would not react to people in trouble without orders from higher up; West German police would not enter the river as this would constitute a border breach. Several children died, like 5-year old Cetin Mert, who fell in and drowned on his fifth birthday in 1975. Cetin Mert was one of the younger victims of the wall, but not the youngest. Baby “Holger H” was aged only 15 months when he was accidentally smothered during what would otherwise have been a successful escape in 1973. In many cases the victims of the Berlin Wall were shot dead by border guards. Sometimes the guards shouted and/or fired warning shots first; sometimes they did not. After the fall of the Berlin Wall many of the guards responsible were prosecuted. Many were convicted of manslaughter, but sentences were lenient. Typically these might be 18 months or so. In many cases (including the cases of the guards who shot Peter Fechter) custodial sentences were commuted to probation immediately. This entry was posted in Germany and tagged Berlin, Berlin Wall, East Berlin, memorial, travel. Bookmark the permalink. The unthinkable happens to people, and is done by people, somewhere every day. What a species we are. Pingback: The Berlin Wall: One wall, two sides, multiple outlooks. | Manuscript. Head. Drawer.